The UniMount is an articulated parallelogram stand with a counter balance designed to support a binocular for astronomical or terrestrial applications. This derives from an idea first marketed since 1995 by Virgo Astronomics, the former Baltimore, MD company, as the Skymount by telescope shops including Company Seven. By 2001 the Skymount was sold by by Orion Telescopes too, still for about $249. Unfortunately, as has been the rage at many US companies, some short-sighted bean counter at Orion sent it off to China to be cloned. They developed a cheaper and comparatively mediocre mimic of the Skymount that remains available from Orion. Of course the Chinese made version brings with it less than half the performance and some simply stupid oversights by our standards. But since most consumers tend to be short-sighted and are likely to buy any cheaper alternative that even resembles the more costly alternative ("where can I buy the cheapest and the fastest"), the Orion product impacted sales of the Skymount. That was among the last factors that convinced the owners of Virgo Astronomics to close. Universal Astronomics took on the task of making their own UniMount that is based on the Skymount, but with some differences and providing even better versatility. In fact the UniMount remains so much better, even at double the cost of the Orion Chinese-made alternative, that we've been urged customers who compared to keep the Orion mount alongside the UniMount; this really has helped us sell the UniMount to those who visit our showroom to compare. 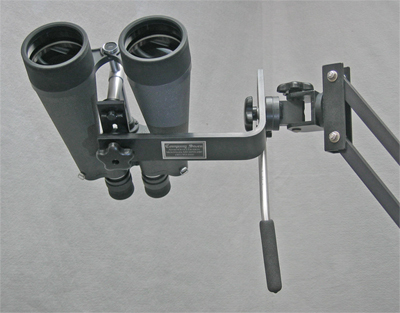 Right: Universal Astronomics UniMount Parallelogram Stand with optional 80mm Binocular and Tripod (98,506 Bytes). The cantilevered beam arrangement support a hinged bracket to accommodate a binocular on one end, with a counter balance weight at the other of the beam. The counterweight rides on a shaft that can be extended or retracted to vary its leverage effect. The articulated parallelogram beams are supported by a machined Post located near the center of the assembly, made in a way which permits 360 degree rotation of the cantilevered beam assembly. The Post is machined to permit the parallelogram beams to pivot across a 123 degrees span thereby raising the payload up or down. The entire beam and post assembly is supported by an optional suitable Field Tripod or Pier. This stand looks awkward, has more possible adjustments than politicians have excuses, and is not all that pretty to look at - even the welds are nothing like what you'd see on a NASA spacecraft. However, UniMount remains a most versatile platform incorporating features of particular value to those involved in astronomy. It will allow a binocular to be kept steady and in an orientation that will be comfortable for the user. It is a modular system to which one can add or change a variety of hardware to tailor it for varying payloads or uses. This is the best Parallelogram stand system offered by Company Seven, and one is routinely displayed in our showroom on the lightweight aluminum tripod. Make the experience more comfortable for the observer whether standing, seated or reclining. UniMount does this by allowing the user to position a counter balanced binocular high enough to provide more comfortable head positioning; one could even be reclined in a lawn chair while observing objects overhead. With a conventional Tripod and Head, particularly when looking high overhead or to zenith, and observer is likely to encounter restrictions when the observers face can not reach the binocular eyepieces. Put the bincoular in an high enough orientation over the observer so that it is more comfortable to look through the binocular over extended sessions. Support the binocular steadily without vibrations commonly encountered when hand holding or when using a heavy binocular in a conventional camera alt-azimuth head. Permit movements panning the binocular smoothly and without static friction commonly encountered with conventional alt-azimuth camera and heads. And when one stops moving the binocular, then there is no sag as may be experienced with fluid heads. permit very smooth movement of a binocular up or down, left and right. Putting It Together Company Seven has these stands provided with the features that most of the more demanding customers will seek. The UniMount we provide is a rather deluxe arrangement. 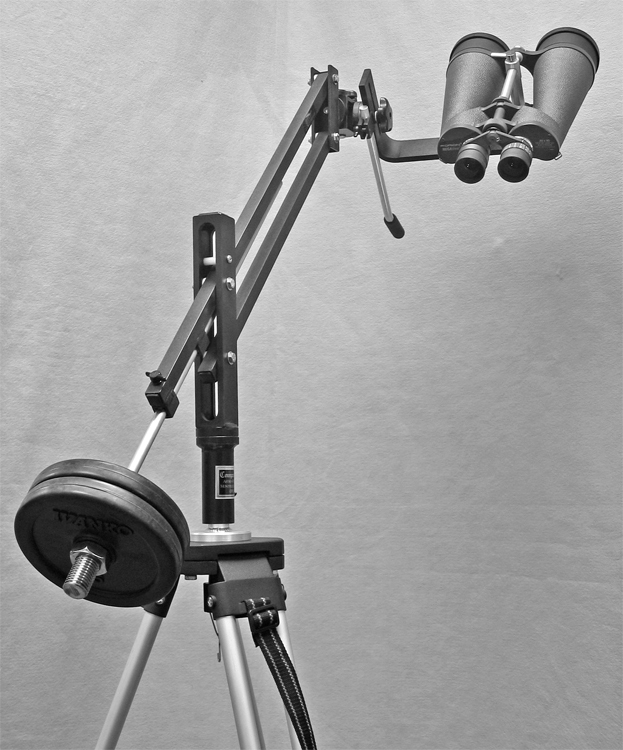 The UniMount Light is available with or without the Swivel Assembly; this is the articulated joint at the end near the binocular (shown in the images on this page). Company Seven recommends this component be provided and so we will stock the systems with it. There may be some customers who prefer to do without it, and for them we can special order the assembly. Counterweights are selected based on variables including user payload, and space saving preferences if any. For example, one can order the UniMount with one 5 lb. counterweight and this will accommodate most consumer oriented lighter weight binoculars up to about 80 mm aperture however, to balance the payload with one counterweight it requires extending the counterweight shaft out to about sixteen inches (41 cm) from the mount. On the other hand, if you intend to employ the stand in a location where you wish to keep the extension from the center of the stand to a minimum of six inches (15 cm) or so, then you can order a total of two 5 lb. counterweights and use these closer in to the stand than that which would be necessary with one weight. The tripod choices we offer are quite satisfactory for this stand. All tripods we suggest for this will have provisions for adjustment of height, adjustable span leg spreader bars to keep the legs from swinging out too far. And each tripod is routinely equipped with rubber pads on the bottom of each leg so that this will not mar wood or other vulnerable flooring. We provide the choice of tripod legs with metal tips instead of the pads for use outdoors, these tips feature a rubber pad that can be threaded down to protect flooring. The Tripod Mounting Post (TMP) is a 1 inch (50mm) diameter post which is threaded onto the Field Tripod. The UniMount slides onto this post and is secured in place by means of a hand knob. The TMP is available with a variety of thread to permits its installation onto a variety of tripods; if you do not order a Field Tripod with your UniMount then please specify your thread preference. The choices of tripod may vary from year to year but generally include a light weight aluminum surveyor tripod, and another tripod appearing nearly identical but with the legs made of wood. Either stand will manage the system well and the aluminum model is so light weight that virtually anyone can move it about quite readily. However if you plan to use the UniMount in wind prone sites, or on platforms that may be subject to vibrations, then we recommend use of the wood tripod which inherently dampens resonances better than aluminum. And with either choice of tripod you might notice complete elimination of vibrations if you buy an optional set of three Vibration Suppression Pads that are set under each tripod foot to dampen resonating vibrations that may come up or down through the system. UA offers an optional L shaped adapter that is made to install most binoculars with bridge mounted 1/4 inch - 20 tpi threaded attachment sockets onto the UniMount. Company Seven offers this L-Bracket and a variety of hardware made by the binocular makers for this purpose, we will be happy to help you put a system together. Construction This mechanism is fully machined of aluminum and stainless steel, bolted and in places welded together in the United States. The components are either powder coated in matte black, or left in natural metal finish. The provided counterweights are made of steel, then clad in black rubber. It is possible to leave the UniMount outdoors with a suitable weatherproof binocular and metal tripod or pier. However, Company Seven recommends users avoid leaving the set outdoors for extended periods in environments where salt air may cause corrosion or promote the development of fungus. Above: UniMount readied for storage, note how we turn the Binocular Support Bracket (57,650 Bytes). Above: UniMount with optional field tripod in Company Seven's optional padded carrying bag ready to go (41,762 Bytes). Note the full length padded partition between the tripod and stand; smart thinking for our customers! care must be taken when assembling or moving the mount, particularly near windows. You should set the UniMount far enough back from a window so that it can not accidentally swing into the glass. do not put your hand or fingers in the gap between the two long parallel beam sections. keep aware of the position of the stand and its payload in the dark. It is possible to run into the UniMount or its tripod in the dark. To insure that the above precautions are followed, the UniMount should not be used by unsupervised young children. AL Tripod Weight 8. 7 lbs / 4 kg. Above Right: UniMount Parallelogram Stand with optional 80mm Binocular. Note the Hinge Assembly, and head positioning Handle (98,506 Bytes). * Tripod and extra counterweights optional. Specifications are subject to change without notice. Universal Astronomics Products Are Made In The USA: all mechanical components are fully made in the USA, then we attain highest degree of quality control as each component that comes through Company Seven is inspected again to insure nominal fit, finish and performance prior to delivery. There is no law that requires most products sold in the U.S.A. to be marked or labeled as such, or make any representation about their amount if U.S. made content. However we guarantee our Universal Astronomics products comply with the United States Federal Trade Commission's 'Made In USA' policy. For a product to be called Made in USA, or claimed to be of domestic origin without qualifications or limits on the claim, the product must be "all or virtually all" made in the United States. 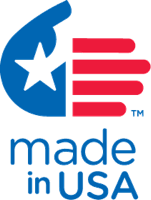 The term "United States" as referred to the FTC's Enforcement Policy Statement Complying With The Made In USA Standard, includes the 50 states (yes including Hawaii), the District of Columbia, and the U.S. territories and possessions. The term "all or virtually all" means that all significant parts and processing that go into making the product must be of US origin; that is to say the product contains none or virtually no foreign content. Please feel free to contact Company Seven to order or to discuss your requirements.